Samsung S7 Edge SM-G935F & SM-G935FD Frp Remove Required File. NOTE: Those File Support For Binary U1 & U2. 1# Download SM-G935F Combition File. 2# Download SM-G935FD Combition File. 3# Download SM-G935F Stock Rom. 4# Download SM-G935FD Stock Rom. 5# Download Frp Remove Tool. Samsung S7 Edge SM-G935F & SM-G935FD Frp Remove Method. 3# Connect your phone on pc using data cable. 6# Select Ap tab on combition file. 7# Now your phone open factory mode. 8# Go to setting and click 4 time build namber tab. 9# Open developer option now enable usb dubbing mode. 10# Connect your on pc and open frp remove tool. 11# Now your phone adb mode show on tool and remove frp click. 12# Now again open download and connect pc. 13# Now download stock flashing with odin tool. 14# Select AP,CP CSC,BL On odin tool. 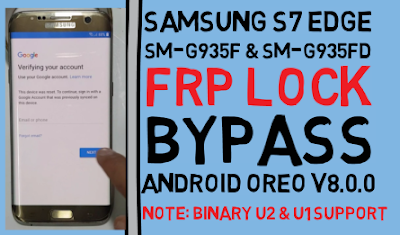 15# Now your phone oreo v8.0.0 frp lock remove complite.